—you don't have too many if they all fit on the couch"
1. Toys are for training. Play with the other dogs. 2. Eat your food or someone else will. Guard your bone or someone will steal it. 3. Guarding your personal space is allowed. Fighting is not. Mean dogs sleep outside. 4. Nail trimming and ear cleaning is mandatory. We can do it the easy way or the hard way. 5. No getting serious. Load up for the dog park! "I'm Right Here, Mom" aka "Brown Dog"
Tehya is the original Dog Box dog. We've been together since she was eight weeks old and she is very much a one-girl dog. That is to say, she's underfoot a lot. She loves parties, camping, bonfires, rodeos, and other events where nobody notices that she's raiding the trash. Unlike the rest of the Dog Box dogs, Tehya wouldn't know how to run off if she tried. She was once mistaken for a bear while trying to get into the wrong tent after going out to pee. Skills: Tehya earned her CGC certificate last winter and is now working on being more helpful around the house - her latest contribution is retrieving the remote control. 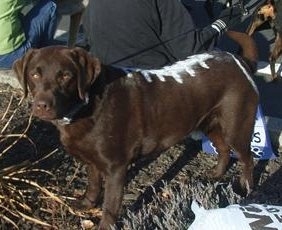 She was in the UI Homecoming parade dressed as a football and LOVED the attention! Sawyer walks both sides of the Dog Box fence. Part hunting hound, part goofy house pet, he's all personality. He loves to play and avoids trouble whenever possible - but he's never lost a fight either. Sawyer is a super high-jumper and is not stopped by mere 6-foot fences. He likes to rush other dogs and leap over them at the last second, because he can. Sawyer is especially fond of small dogs and plays extra gently with puppies. We've had a lot of dogs stay the Dog Box over the last few years. They've come and gone with roommates, boyfriends, and hunting partners, but we miss them all!